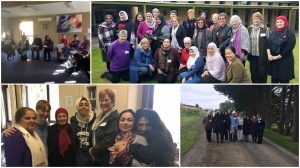 The JCMA Women’s Events offer an exciting and stimulating opportunity for women to share experiences and perspectives in the conversation of faith and hope towards the future of humanity. Women have the opportunity to actively engage with one another and explore ways in which they can make a difference; this will be via informal small group and general discussion. JCMA is excited to be preparing events for 2017! Watch this space, or for an updated list of ongoing events, keep an eye out on our Facebook page! Cost: $260 plus $12.53 Eventbrite charges. Places limited. Please RSVP by Friday 22 February 2019. To register go to Eventbrite: https://jcmawomen2019.eventbrite.com.au. 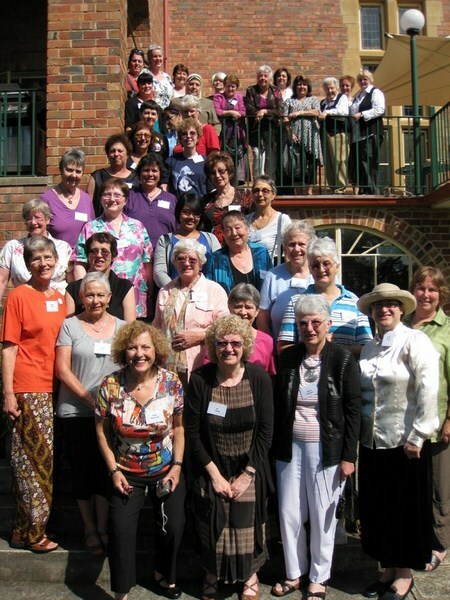 The JCMA Women’s conferences are for women who identify as Jewish, Christian or Muslim. Halal and Kosher meals provided. Please bring your own linen, towels, soap and toiletries. More info: Contact Ginette Everest (03) 9287 5590 or womenconference@jcma.org.au. JCMA seeks to showcase each of our three faiths to the broader community. 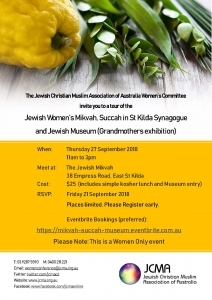 As a follow-on from our very successful tours of the Islamic Museum of Victoria in June, and the Jewish Mikvah, Synagogue and Jewish Museum of Australia in September, JCMA women have organised a tour of St Paul’s Cathedral, diagonally opposite Flinders Street Station. The tour will be followed by morning tea, which will be scones with jam and cream. Halal, made with Kosher ingredients. Please advise any other dietary requirements on the Eventbrite form. Time: 10.00am – 12.30 pm Meet at 9.45 just inside the Flinders Street door of the Cathedral. Venue: St Paul’s Cathedral, Corner Flinders Street & Swanston Street. Just a reminder about our fascinating tour of three fascinating places of Jewish interest. There’s been a lot of interest in this, so don’t forget to book your place. When: Thursday September 27, from 11am to 3pm. 11am – 12 pm. Guided tour of the Jewish Women’s Mikvah (ritual baths). 12.15pm – 1.45pm. LightKosher lunch in the succah at St Kilda Synagogue. During lunch, the Rabbi will give us a short explanation of the Jewish festival of Succot and the symbols associated with it. 2pm – 3 pm. Visit to the Jewish Museum to see the exhibition, “Our Grandmothers”, which celebrates the love, spirit, strength and wisdom embodied by grandmothers in Judaism. Cost: $25 which includes the cost of the tour, the lunch and admission to the Museum. Meeting: We will meet at the Mikvah, 38 Empress Road East St Kilda at 10.45am for an 11 am start. More info: Contact Ginette Everest (03) 9287 5590 or womenconference@jcma.org.au. Details: See the attached flyer. Don’t miss out. Do come. We’d love to see as many of you as possible for this great event. 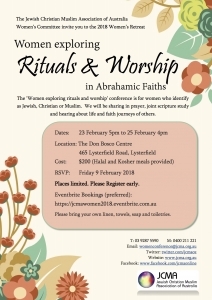 The theme of the Conference is ‘Women Exploring Rituals & Worship” exploring prayer, joint scripture study, hearing about the life experiences and faith journeys of others. All of this will be around living together and sharing meals over a three day period and sharing in the three faith’s sacred prayer times. Meals will be vegetarian and conform to Halal requirements. Strict Kosher food will be arranged for those who require it. Please advise us of any special dietary requirements. There are limited numbers so please book early. 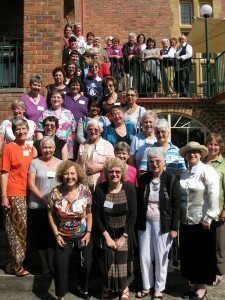 For more information contact Ginette Everest (03) 9287 5590 or womenconference@jcma.org.au. Note: The conference is for those who identify as Jewish, Christian or Muslim. The ‘Inspiring Women of Faith’ conference is for women who identify as Jewish, Christian or Muslim. We shared in prayer, joint scripture study and hearing about life experiences of others that inspire us. As a group of women from Judaism, Christianity and Islam we represented the variety and depth within each faith tradition. Over the conference we were able to observe each other’s prayer rituals lead by members of each of the religious groups. It was carefully planned to fit into the times of traditional weekly/daily routines and in sharing and experiencing each other’s holy days of Friday, Saturday and Sunday we got to learn about each other’s practices and encounter deeply held beliefs. 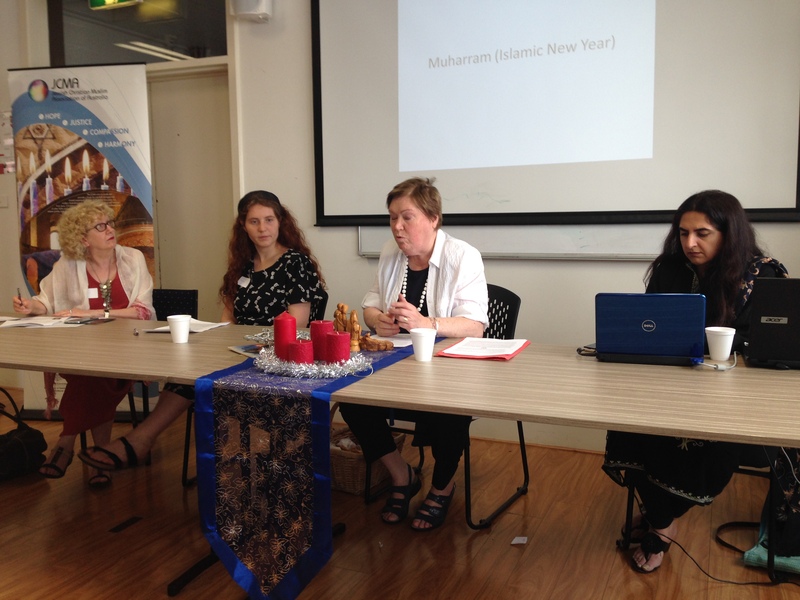 On Sunday 4th of December 2016 the Jewish Christian Muslim Association of Australia (JCMA) women’s committee hosted an event, at the Islamic Council of Victoria, with talks on seasonal celebrations of the three Abrahamic faiths. It was a well-attended event with an audience of over 35 women. An opportunity to make new friends and learn from each other over shared food for the festive season. The first speaker was Nomi Kaltman who spoke on the Jewish Festival of Lights, Chanukah and its background, history and traditions. These traditions range from lighting the Menorah to eating foods fried or baked in oil to commemorate the miracle of keeping the Second Temple’s Menorah alight for eight days. Nomi was followed by Irene Donohue Clyne who spoke on the Christmas celebrations and the influence of cultural symbols associated with it. Irene also emphasised on the spirit of Christmas which celebrates the birth of Prophet Jesus pbuh (peace be upon him) and an integral part of Christmas is the gathering of family and friends. This event is a women only event. 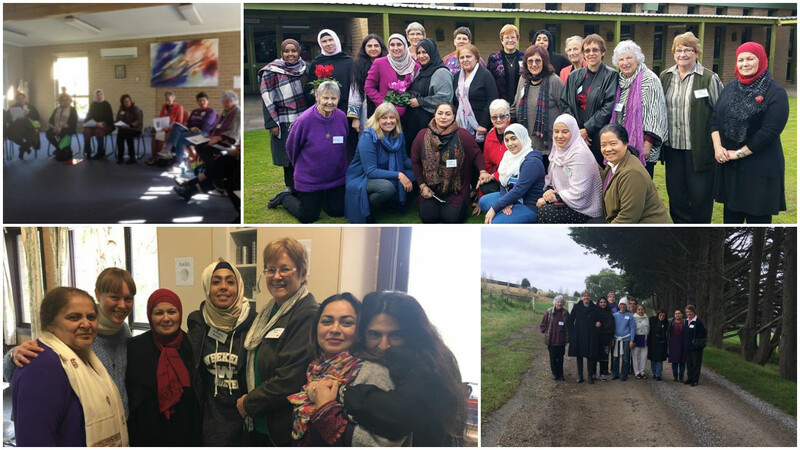 Connect with like minded women in faith and spirituality and get together in the spirit of the festive season at the Jewish Christian Muslim Association of Australia (JCMA) Women’s Seasonal Celebrations womens conference. Our speakers are Ayesha Bux on Muharram (Muslim New Year), Irene Donohoue Clyne on Christmas and Nomi Kaltmann on Chanukah (Jewish Festival of Lights). Learn more about the celebrations, ask questions and meet some new friends. Everyone is invited to bring a plate of vegetarian food appropriate for their faith celebration at this time of the year to share with each other. 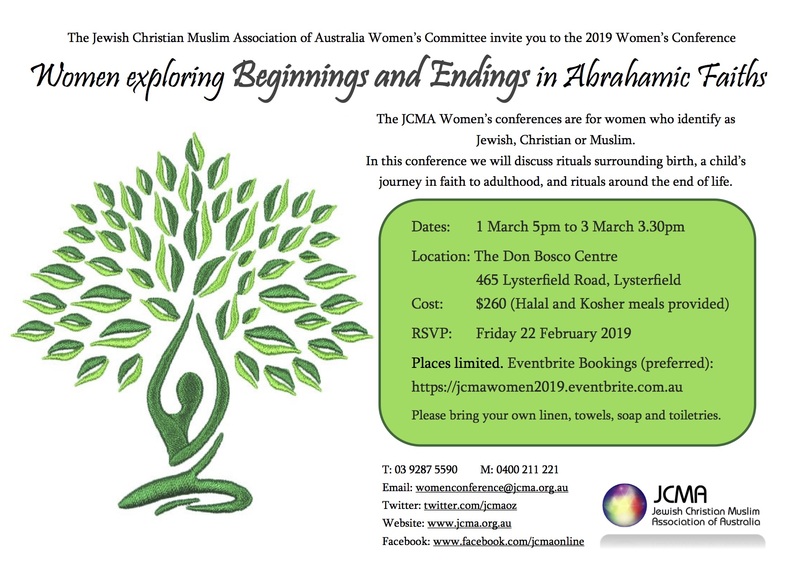 For more information: Email: womenconference@jcma.org.au or call (03) 9287 5590 or 0400 211 221. This women’s only forum will be based on presentations from the Scriptures of the three Abrahamic faiths on the concept of Compassion. Program will consist of Video on Charter of Compassion, Speaker Presentations, Q&A, Group discussions, etc. 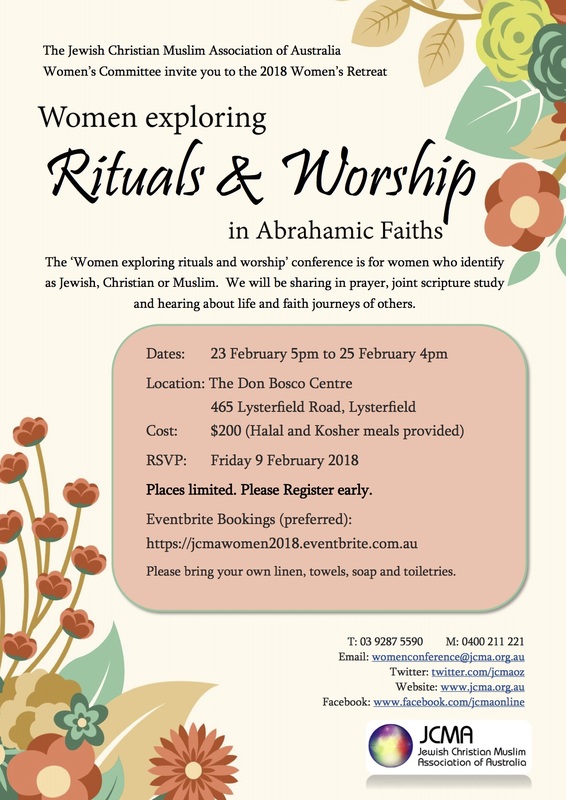 This women’s only forum provides a unique opportunity to understand and appreciate the significance of the head covering in each of the three Abrahamic faiths. Hear from speakers discussing its religious and historical origins, how it is viewed in the modern era and what it means for them today. A light lunch will be served at 1pm, followed by speaker presentations with Q&A/group discussions. RSVP: womenconference@JCMA.org.au for catering purposes. At the 7th annual women’s conference, a highlight was a presentation by Sarah Sabagh and Rose Bogarts of the very successful show “My image, My dress, My choice” in which Muslim women model appropriate Islamic clothing and each woman explains why she chooses to wear a hijab. The issue of what is culture and what is religion was also explored. The program covered symbols of our faiths; women practising peace; sacred texts from the three faiths and personal faith journeys.